Looking good! Great to see so much progress the last while. Ok, both speakers mids and tweeters are making music, and with the help of some Digital bass EQ I could not be happier. Ok, so now the Vivace's trio of drivers are all doing their thing. Not perfection yet, but it is nice to have extension down to the low 30Hz range. It starts to sound like it won't disappoint in the depart down below. Maybe with a bit more tweaking I might just to decide to invite some of the loyalists and support team members over for a taste of what is to come. What is in a measurement, what can one tell from it? Here is room averaged RTA measurement of the Vivace at its current stage of development. Measurement is from about 2m away. 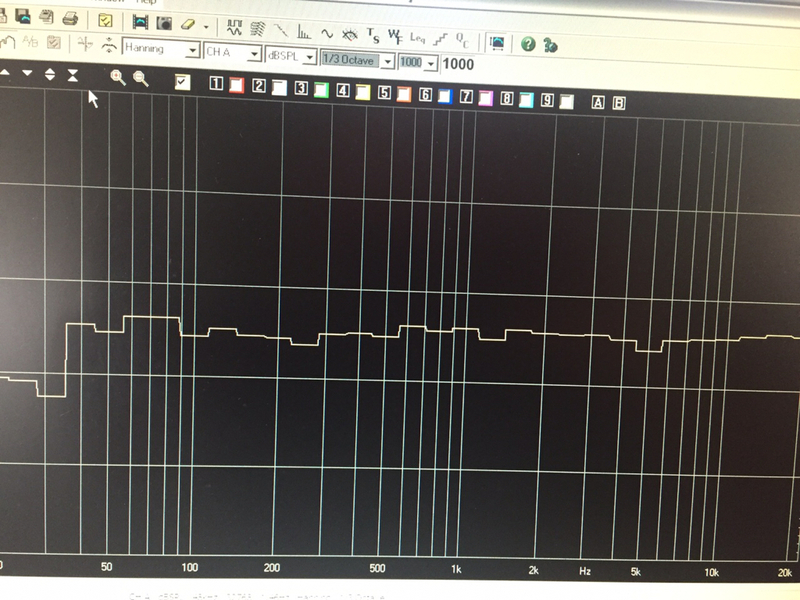 Looking good, but whats the Y axis setting ... what crossover frequencies & slopes are you using, or a secret! Crossover points and slopes are not necessarily a secret but I am listening to a few options. The bass/mid crossover point is at 180hz with a hybrid 1st order slope( Bass is initially a 1st order slope and the roll of a bit more steeper towards midrange, and mid is the same just the inverse). The mid/tweeter crossover will be either at 3kHz or 3.9kHz with classical symmetrical LR 2nd order slopes. All these are the acoustical slopes, the electrical typologies are different -working therefore with the drivers' responses in the cabinet. Back to the speakers. the cabinets might be the most rigid i have ever seen and if you look past the developmental stat you will immediately see these are going to be appealing speakers to have in any environment. the shape is conservatively modern and the footprint very small compared to similar speakers in the market but with a wider front baffle that curves to the back creating an illusion of being narrower that it really is. the bass is very full and goes deep. I reckon an F3 around 33hz. it filled the room with ease and didn't leave me wanting. We then had it on the Pathos TT. that made these speakers really shine. bass was good and much tighter. the midrange was super clear and sweet (effortless) and highs had a sparkle without sibilance. these speakers demand the best. easy to drive but give it super equipment and it will outshine some of the big guns very easily. Soon? ("Soon" is frustratingly similar to "just now"). Thank you very much, Rudi, for the kind words. I think your take on what the Vivace's sound like at the moment is in line with my own impressions. Although there is still some work to be done, I do believe the design is proving to show great potential. I feel satisfied that the effort invested so far is reflected in what I hear, and what you described in your impressions. The mids and highs are probably as good as it gets, full of life and colour but still very evenhanded. The bass response is still not optimised as the final value of the bass choke(most expensive crossover component) still need to be sorted. At the moment the extension and voice down to the low 30's are in place but the speed accuracy and quality are let down by the suboptimal resistance of the low pass bass choke. (for those interested, the current value is 8H with a DC value of 1.8 Ohm, the intended choke will be 8H but with a DC value of not more than 0.25 Ohm). With the new choke, the bass driver will be optimised with the port within the working volume and the driver's group delay would be greatly enhanced and be close to a sealed alignment. The less loss in the network will obviously also up the bass drivers output with about 1-1,5 dB and hopefully, the coherence will then be right from the low bass to the highs, whereas it is now only through the mids to the highs. I also appreciate your unsolicited feedback on the aesthetic design of the Vivace. Conservatively modern, with a small footprint(my idea of a speaker that can integrate into a living space without drawing attention to it) and the baffle that I wanted to be wide to get the midrange performance that I aimed for but to create the illusion that it is narrower are all things we set out to do. As a side comment, I also smiled at the obvious differences you heard not only by changing the amps(that is cut and dry) but the differences between the interconnects. Not only did you hear the difference between the interconnects but you were on a penny to describe the qualitative differences. I think the fun part of the journey started when we can start to share impressions based on different music, electronics, and maybe even later on to start to give them wings to see how they respond in different environments. Once my cold symptoms were a thing of the past I also had the pleasure of having a listen to the current development of the prototype and below are my thoughts. It is not what they do but how they do it. I found a tiny amount of forwardness (being a recent Harbeth owner this comment must be taken with perspective) and have a uncanny ability to be able to play a large spectrum of musical genres without not wanting to listen more. Stefan is very particular in his design choices and seem not to want to compromise critical performance areas to make a single aspect just simply pleasing. Like voice it less forward and reduce accuracy of complex instruments. They have the transparency to highlight different interconnects and different amplifiers. All the drivers are carefully specked and a great deal of design and thought has gone into the execution. This is not a skin deep or read the cover story. I also had the opportunity to listen to these speakers earlier today. It's been enlightening to hear (and see) the evolution of the Vivace. A while back, I'd listened to the chosen drivers, with a beta crossover, in a different enclosure. This amounted, I suppose, to a 'developmental prototype' to show the potential of the design. Which was already evident at this early stage. it's all come to life in a really tangible way. A true high end speaker is born. Firstly, the broad, you-are-there 3D soundstage really drew me into the performances. Plenty of detail present, yet without any parts of the frequency spectrum standing out for the wrong reasons. Bass was tight and tuneful, with solid impact, but never overpowering. Tonality, perhaps most importantly for me, felt very natural. Guitar, piano, sax, drums, all believable. Overall, my impression was one of balance, perhaps another word to use would be coherence. And, as stated by Rudi, switching to the Pathos amp takes everything up a notch or two. Certainly this seems like the kind of design that'll reward upgrades elsewhere in the system. Mostly, and putting aside all the audiophile words, it was just a real joy to listen to. I'm currently enamoured with David Byrne's Grown Backwards album. Hearing Glass, Concrete & Stone through these Vivaces, reminded me what this is all about. Stefan you can be rightly proud of what you've done here. Thanks, @gavinbirss and @Nidri for popping in and listening and for the complimentary feedback. I am humbled by the positive comments. Although one starts such an undertaking with vision and confidence and courage(sometimes maybe too much so) and based on in-depth research and experience, it is only at this late stage of the development that one really get a good sense of what the potential is of the project. I enjoyed the listening sessions with you guys. We really gave the speakers a workout, from very demanding music at volume levels that I never listen to under normal conditions to playing music, almost as background music and as we discussed the Vivace's sounded very nice. The responsiveness and detail at low levels is really something nice in a speaker. I think it is a testimony of the great lengths we went to in the constraint layer cabinet, the superb bass unit that is very supple at low levels but as the demands increase the hybrid system that it is designed around shows it value and lastly, a well-judged frequency profile helps. I have made some small adjustment from when Rudi listened and also after Gavin's comment about a "tiny amount" of forwardness. Nidri listened to the best version yet. I was aware of that tiny forwardness that Gavin mentioned. In private listening sessions, also with my wife who is very sensitive for that frequency region, it bugged me but it was only on certain recordings and at certain volume levels. I wondered if it would be noticed by someone who doesn't know the speaker so well or the room and equipment for that matter. Last week, after Gavin's comment, I was in Uganda and had a lot of time in the evenings to think and go through all the measurements and assessments and I think I found the way to make the system sound more neutral without killing the texture and harmonic richness. I made the changes a half an hour before Nidri arrived and it proved to be just the medicine. The changes over the past few weeks were really incremental and I think it is like a moth around a flame, circling and getting ever closer. We all agree that the speakers are working well, it is now a question of listening with different ancillaries to see where the final voicing should lie. The difference between interconnects is crystal clear, as is the difference between the Audio Analogue Puccini Anniversary and the Pathos TT. I really have come to appreciate the Cardas brand of cables over the years and like Cardas interconnects especially. My old and trusted and faithful Golden Cross is a very "musical" and refined sounding cable that shows nuances and textures quite well. I have often recommended them blindly to customers. I realise there are other more obvious detailed and perhaps dynamic cables on the market I always feel when I switch to the Golden Cross that I relax and are at home. As for amps, the Pathos is a very demanding amp, both in terms of impedance requirements and in terms of showing any kind of way of frequency anomalies. Although it is sweet it takes no prisoners. On the other hand, the Puccini is more forgiving but not as transparent or detailed. What is clear is that the speakers are not the ceiling in the system, for sure. I am going to look for different electronics now to continue the refinement process, and I will invite some more interested enthusiast to listen. I am especially interested in listening to the Vivace with a high-quality medium powered valve amp, a leaner sounding SS amp and perhaps a Class D amp. I have the Ongaku replica at hand but it with its virtues it would tell me nothing of the speaker per sé. I will take it out but I would rather listen to more real-world amps, integrated amps for practical reasons. Lastly, the good news is that there is movement with wood parts. The mould has been cut to final design and needs only to be rounded off on the 5 axis CNC machine before we can press the 1st units. I learned to have patience and when I read that a company like Macintosh only launch on new amp every 5 years, I know one cannot churn out a range every year with far fewer resources. The progress so far is satisfaction enough.